Athens: Greece’s lenders are sending a team to Athens to inspect a government austerity plan they want implemented in exchange for aid, while Germany suggested a new bailout may have to be renegotiated. Facing a wave of strikes and protests, Greece’s Socialist government is accelerating its debt strategy to meet the terms of an International Monetary Fund and European Union rescue deal so it can receive a new loan next month and avoid bankruptcy. “I can confirm the Eurogroup (of euro zone ministers) will hold an additional meeting as soon as possible, still in October, to discuss the situation of Greece and consider the disbursement of the next tranche," a European Commission spokesman said in Brussels, announcing the troika’s return. 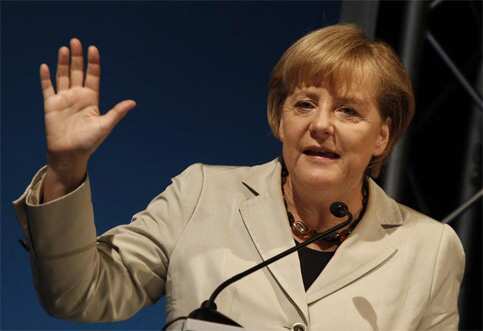 German Chancellor Angela Merkel suggested that parts of a planned new €109 billion ($148.6 billion) rescue for the debt-laden country could be reopened, depending on the outcome of the troika’s audit. “We have to wait and see what the troika ... finds and what it will tell us (whether) we will have to renegotiate or not," she told Greek state television NET, without elaborating. Several hundred activists affiliated with the Greek Communists converged on the finance ministry on Wednesday waving a banner saying “We won’t pay!". They planned to burn bills for a new one-off income tax introduced this summer, while Athens and other parts of the country were hit by transport strikes. If deemed adequate by the inspectors, the new austerity drive will secure an €8 billion loan Greece needs to pay bills and salaries in October and bring it closer to starting a second bailout agreed in July. As a condition of the visit and to resolve the row with the lenders, the Greek government had promised to send a written assurance outlining its new plan to meet its bailout targets. Its contents have not been made public. Germany has repeatedly said negotiations about the details of the second rescue deal can begin only when the troika says Greece has qualified to receive the tranche expected in October, the sixth under a first bailout agreed in 2010. At the same time, leaders from around the world have urged euro zone capitals to end a tortuous debate and create a safety net big enough to prevent Greece’s problems from spreading to other euro members and triggering a fresh global downturn. The second bailout aims to ease Greece’s debt burden by imposing a 21% loss on private Greek bondholders. After intensifying debate among economists and policymakers that only a 50% loss would make the country’s debt viable, more investors have signed up to the bond exchange plan, Greek financial daily Naftemporiki reported. Citing an unidentified finance ministry official, it said Greece’s weeks-long struggle to lure private bondholders into the rescue plan had ended with it reaching the 90% participation target. The finance ministry declined to comment on the report. There is no agreement yet among euro zone governments on whether a renegotiation is needed, including more pain for Greece’s bank creditors, or on a US - sponsored plan to leverage the bloc’s rescue fund to give it more firepower. Germany’s Bundestag (lower house) will vote on Thursday on widening the scope of the European Financial Stability Facility bailout fund, as agreed by the EU leaders on 21 July. Merkel faces a revolt within her conservative camp and may have to rely on support from the opposition Social Democrats and Greens to get the measure approved, damaging her authority. Late on Tuesday, police dispersed about 1,000 anti-austerity protesters with tear gas in Athens’ Syntagma Square, the epicentre of anti-austerity protests. Taxi drivers, bus and tram operators staged strikes on Wednesday, causing long traffic jams leading into the ancient city centre and forcing luggage-hauling tourists scrambling to find rides to the airport. Other trades ranging from craftsmen, printers and tax officials also staged stoppages and activists planned marches on parliament and the port of Piraeus later in the day. “I’ve been trying to find a job for a year now and it’s impossible," said Maria Kappa, a graduate of the School of Philosophy in Athens. “I don’t see the rich people hurt by this austerity, it’s always the poor who have to pay." Lawmakers opened the way to the troika visit on Tuesday by passing a property tax bill. That piles the pressure on Greeks suffering from several waves of belt-tightening and deepens an economic downturn heading into its fourth year. Prime Minister George Papandreou’s 154 Socialist deputies forced the measure through in the 300-seat parliament. In the accelerated strategy, the government will cut the 730,000 public workforce by a fifth, reduce the public wage bill by 20%, as well as lower overall pensions by 4% in addition to a 10% cut already agreed in previous plans. It will also now extend the new real estate tax until 2014, two years longer than originally planned, after the troika judged Greece’s estimate that it would raise €2 billion a year to be too high.